This summer, we highlight the shortlisted candidates of the 2018 ECF Princess Margriet Award for Culture – all of whom fit our theme Courageous Citizens in their own right. Meet Marika Schmiedt. Marika Schmiedt is a visual artist, activist and researcher based in Vienna, Austria – turning the spotlight on Roma people in Europe. Marika’s primary focus is the way discourses are imbued with hegemonic ideologies. She looks at how majoritarian narratives within existing configurations of nation-state power work hand-in-hand with structural power matrices subsumed in the notions of Occidentalism, regimes of Whiteness, Christianity, patriarchy and hetero-normativity. Through her work, Schmiedt addresses the situation of Roma people in Europe from her perspective as a Roma European woman. She highlights the undercurrent of fascism that have persisted ever since National Socialist times. By creating a visible history of past and present abuse of – and xenophobia towards – the Roma, Sinti and Yenish people, the artist pokes at unhealed wounds, and reveals what is uncomfortable to many – making the audience (re-)live unwanted feelings of pain, guilt and shame. 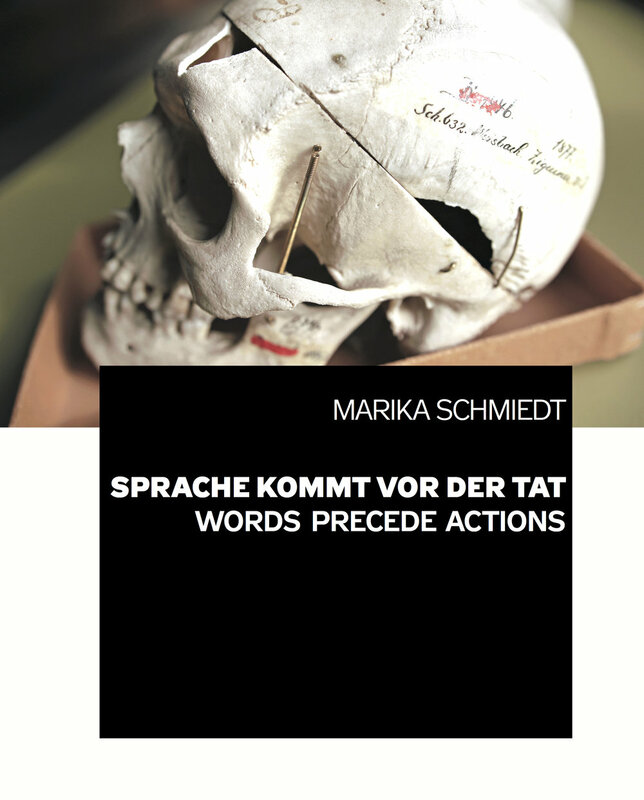 Catalogue, Words precede actions. The context of language, racism, economy and power,196 pages (German/English), 24 × 30 cm, numerous b/w and colour illustrations, 2018. What characterises Schmiedt’s work is her determination to unravel the very mechanisms by which discrimination is propelled and sustained. These have notably been addressed by means of interventions in public space, which have raised controversial and heated debates. But Schmiedt does not shy away from confrontation. She keeps addressing the issues of persistent racism that are most important to her and to the future of a truly democratic European society in which equality is a core value. Over the years, Schmiedt’s work has taken the form of films and video, (public) installations and interventions, publications and prints. From her position of extensive knowledge of the history and culture of Roma people from past to present, she is regularly invited to discuss current issues in radio shows and lectures. As an activist, she frequently participates in protests for the right of minorities and refugees, documenting the events on video and sharing them on her website. Her work has been presented in solo and collective exhibitions, notably Call the Witness (Roma Pavilion, 2011 Venice Biennale), Roma Protokoll (2011, Vienna) and more recently, Was bleibt – Fragmente einer fortwährenden Vergangenheit (2015, Akademie der bildenden Künste and Dokumentationsarchiv des Österreichischen Widerstandes, Vienna). Marika Schmiedt on the notion of the European Cultural Foundation's current theme Courageous Citizens. Find out more about Marika Schmiedt's work on her website.